Cotton Candy Machine offers the fresh hot feel and taste of the cotton candy. For cotton candy to taste great it has to be made fresh and not bagged over long periods of time. 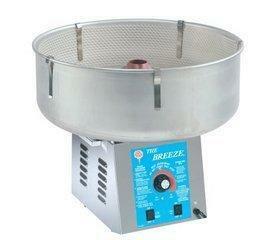 This unit allows for up to three cones a minute when fully warmed up. Each cotton candy cone can be made with the standard cone, it also offers different colored sugar floss such as blue or pink.